well just been playin a little better so thought i would share some of the shots .most were against some pretty strong players . 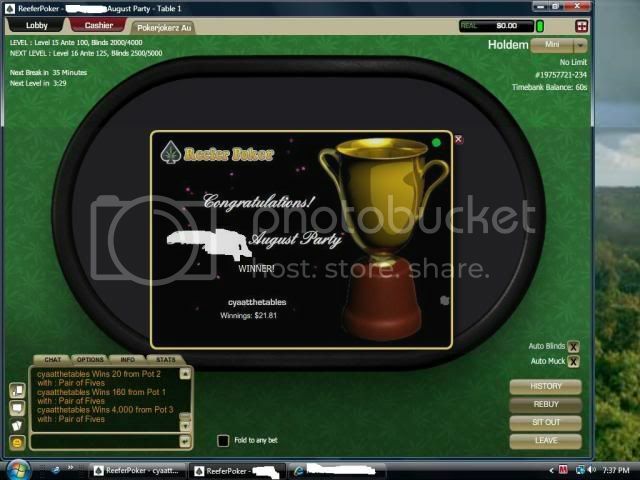 and even won 30 cents in a freeroll on pit bull not pictured the br is building steadily . well just another itm cash cant wait till the big cashes start lol. 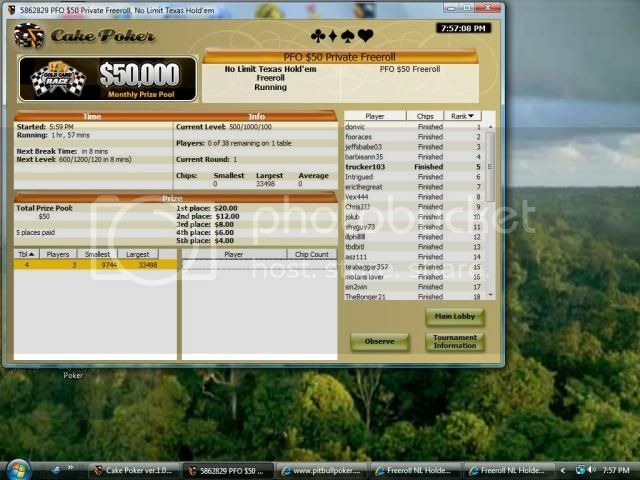 You're a winner of the FREEROLL tournament "$25 Freeroll" on 2009-07-03 14:00:00! You came in 11 place. Congratulations! I am pleased to inform you that you have won $ 0,20 ! Your winnings will now be placed in your player account. 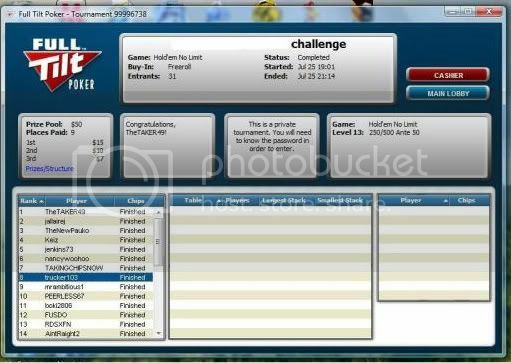 You're a winner of the FREEROLL tournament "$25 Freeroll" on 2009-07-03 20:00:00! You came in 49 place. Congratulations! I am pleased to inform you that you have won $ 0,08 ! Your winnings will now be placed in your player account. 2 little cashes on friday its not about the money its how well or bad u played . just some more good games for peanuts and a prize just kidding play well lately just enjoying the games more . yeah just wish the wins were bigger but then u go with what your comfortable playing for now . 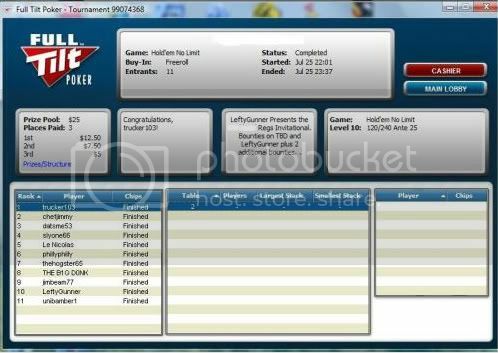 got another 2 tourney dollars in a full tilt freeroll last night . i would put a screen shot up but says ive exceeded my limit 10 shots ? is there a way to increase or if i delete wont they come off the forum posts already posted ? ty for any help . The way around the limit is to have a photo hosting site like photobucket (its free). Upload the ss to there and use the img link and past in your post. 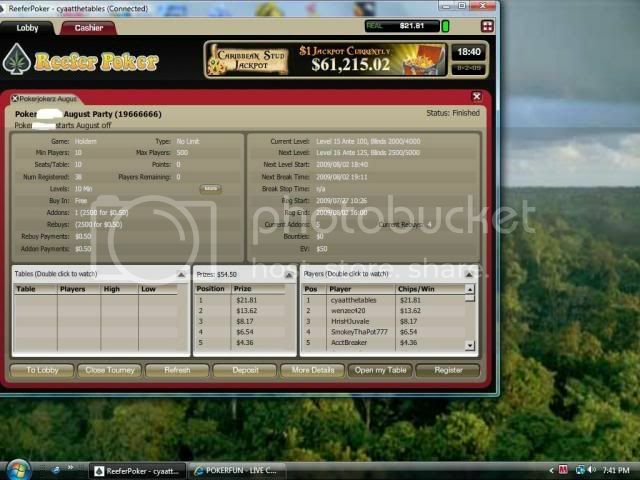 You're a winner of the FREEROLL tournament "$25 Freeroll" on 2009-07-26 08:00:00! You came in 4 place. Congratulations! I am pleased to inform you that you have won $ 1,50 ! Your winnings will now be placed in your player account. You finished the tournament in 1172nd place. A USD 1.80 award has been credited to your Real Money account. 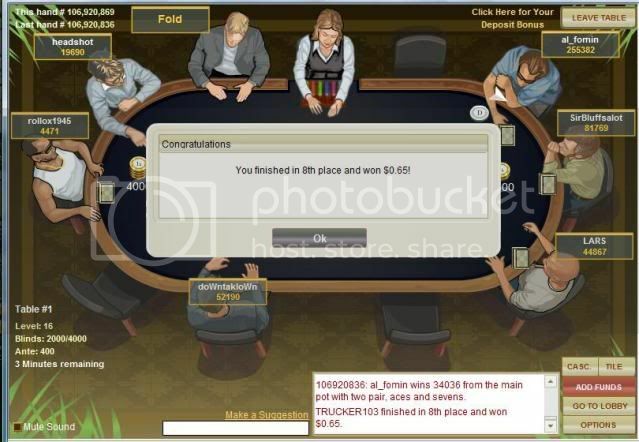 this was a great game freeroll rebuy lol i dont rebuy or addon didnt have any money on reefer anyway but to me that is not poker your out and get a mulligan lol good br start on there cool. If he is very interesting and motivate you, being gaining small victories little by little and to see as the BankRoll is increased. And sometimes that enormous victory would arrive. If one insists on improving.